Looks like a full house! We usually manage to leave kit around the display table. Sometimes, like last year, we had a bonus as the table next to us never turned up so we had some breathing room. Generally, we usually have enough space to stack some suitcases around the table. I'm hopefully going to be on site about 8.30 to coordinate the sign-in. I'll send a round robin on FB with my number in case anyone doesn't have it. I will be flying in. I have not strarted my new job yet so waiting for approval on dates. I wont get to london till friday evening so will be a LFCC saturday morning. What time do you normally stay till in the evenings. Maybe i can bring our gear in when i arrive? I dont like the sound of leaving it in the car! So who here is doing all 3 days? My mistake. Apparently the summer holidays will have started by then so can be there some time in the morning now. OK, so were meeting up about 830 Friday. Whereabouts? The Olympia is a fairly large place. Great ! I will be there from Thursday til Monday. My Hotel isn't far so if someone wants to drop gear when we go to the dinner fine with me. Exhibitor Entry is at the 2nd Gate in Olympia Way, the street to Kensington (Olympia) Station. Right, pre-booked a car parking spot for the Sunday. Gary, just re-reading the thread - by the look of it you would have to buy your son a ticket as all the bands have been accounted for. Just so you can take it into account, the wristbands give access before and after the show times but tickets don't. (Mainly just so you don't leave stuff and cant get back in, although generally we can sort things out) He would probably have to come in and out by the main doors but thats not really an issue. Just a heads up for you. Thanks for the info Matt. Ive bought tickets for Saturday an sunday for my lad already. We wont be going to the convention on friday only to park the car for the weekend. Thats a shame about not getting early entry. I will see if i can wangle it on saturday morning if he can get in a bit earlier with me so we can get geared up as he will be a smartgunner with us now. Sorry guys I am going to have cancel. I have some things come up and no way can I make it due to current situation. Plan is to visit by end of the year. Heading to the Con tomorrow so might see a few of you in my wanders. Going as 'Mission briefing Marine' as been boiling at work all week. The pics of you tough'ens in full armour put me to shame. Come and find us. We have a table in one of the main halls by the cosplay zone/stage. Would be good to meet up! Hadn't been to LFCC for years and am impressed in how they seem to b le making better use of space - didn't seem quite as crowded as before. Was quite busy so didn't really get to say hi, did see someone on my travels, apologies for not grabbing you for a chat. 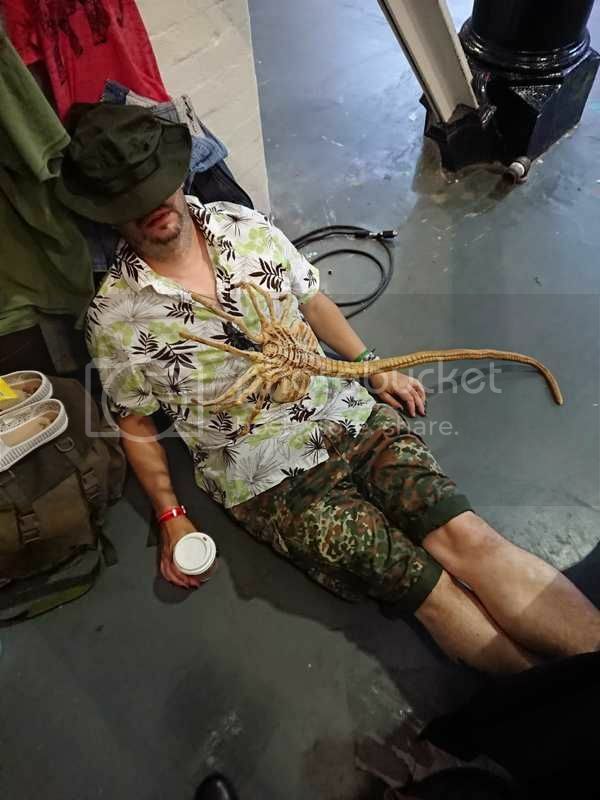 Managed to grab Gorman's autograph and got pics with some good costumes (the family with a load lifter and junior marine in homemade armour, and a Ripley who seemingly had the same idea of having a facehugger on her back). Hope you all had fun and enjoyed the cooler air today. I hope everyone made it back home by now. Pleasure seeing you all (again). Down & clear. Photos to follow.